Welcome to the second official installment of my latest series: I’m 5’2”, and… I say official because I feel like I’ve been writing for my fellow petite girls my entire career, but I guess it was about time we made it legit. A few weeks ago, I shared my favorite jeans, so I thought the natural next step would be the best tops to wear them with. As I mentioned last time, while my height is nothing to complain about, it has, at times, posed its challenges when it comes to shopping and finding things that fit me in the best way possible—especially with tops, which are among the more difficult items to tailor. So today I’m sharing my favorite tops that seem to fit just right. From tees to blouses to crop tops to knits, there’s something for everyone and a few repeat brands I suggest you take note of. Simply continue on to shop my picks. I get so many compliments whenever I wear this pretty blouse. The color of the moment at a price you can’t say no to. I love wearing this cropped tee on vacations over my bathing suits with shorts or a skirt. I have this in black, and it’s my favorite party top. I wear this whenever I feel like my look needs a little more excitement. I own and love two Brock blouses from previous seasons that are no longer available, but this one feels like a combination of both. The outfit on the model is my favorite way to wear this one. I have this top in last season’s print and it’s perfect for tucking into jeans. Obsessed with Posse’s summer tops. I have this in red and love to wear it with the matching pants. Throwing this cardigan in here because I love wearing it all the way buttoned up as a top. Rumi Neely really knows how to make a good bodysuit. I live in white T-shirts, and this is my favorite. It also happens to be the most affordable. Fun-fact: I actually had the front slits on this tunic sewed shut and wore it as a dress. The best thing about this Ganni top is that you can make it longer or shorter via the drawstring front. Everyone I know has this top, and I can now attest to why. Cotton Citizen’s cropped sweatshirts are the perfect length on my petite frame. Another great crop top from Flynn Skye. 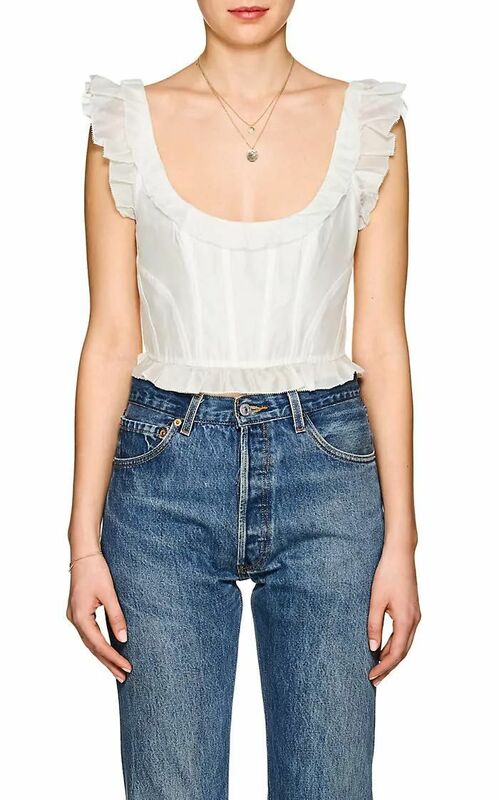 I love this top because you can wear it tied as shown or tuck it into jeans and wear the tie as a belt. I have this in black and wear it twice a week. Now that you’ve got the top(s), see the best jeans to wear them with.